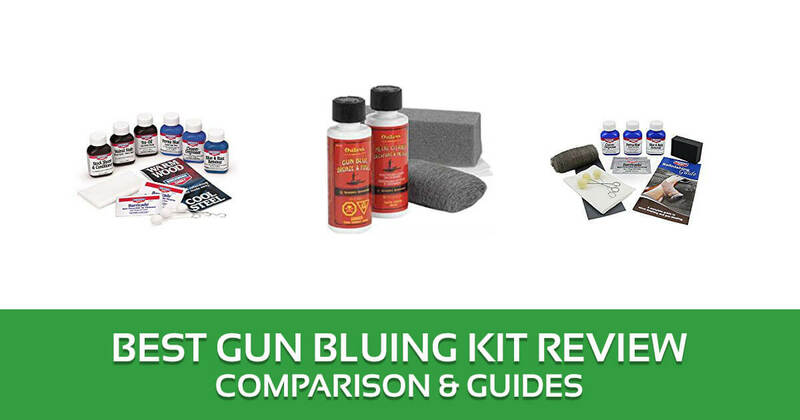 Have you been looking for the best gun bluing kit but have had little success with your previous choices? Look no further because I have discovered the best there is! Bluing is the technique used in enhancing the appearance, particularly the metallic shine, of guns and in protecting its metal finish from superficial scratching. Even the best guns will benefit from regular bluing, especially when these are used on a regular basis. Many of the bluing kits in my list are affordable so there’s no excuse for budget-conscious owners to skip on it. Besides, a better-looking gun with its blue-black shine restored makes the investment in money, time and effort worth it. 5 Who Makes The Best Gun Blue Kit? Read on for my gun bluing kit reviews for the ones that deliver on the promise of increased metallic shine and reduced glare for your guns. Beginners who want to learn more about bluing without making too many mistakes may appreciate the Birchwood Casey liquid kit. Everything that you will need already comes with the package except for the water. These include the 3-ounce Perma Blue liquid gun blue, 3-ounce blue and rust remover, 3-ounce cleaner-degreaser, bluing applicators, and steel wool pads. There are even gun wipes, a sponge and a service cloth. The complete instruction guide contains easy-to-follow, step-by-step bluing instructions so there’s no second-guessing yourself. But a beginner may want to read it twice just to be sure. The liquids are enough for a few guns depending on the number of coats desired. An old gun may need 35-40 coats to bring out most of its metallic look, but a newer gun may only need 30 coats or so. The multiple coats are a must because the blue isn’t as rich as pictured. The process of applying and reapplying the coats may be time-consuming but the final results will make it worth your while. 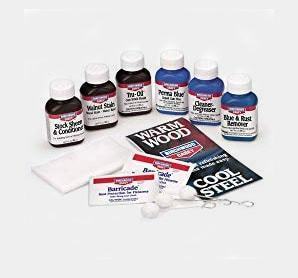 The kit includes 3-ounce containers of walnut stain, blue and rust remover, gunstock finish, cleaner-degreaser, stock sheen and conditioner, and Perma Blue liquid gun blue. There are also bluing applicators, rust protection wipes, service cloth, and sponge. But it isn’t as complete as the manufacturer says it is. You have to buy sandpaper and steel wool for the removal of rust, dirt, and debris from the gun’s surface. The bluing process is clearly laid out on the instructions manual. There’s even a troubleshooting section where issues like the metal not turning blue are explained. The kit doesn’t work on aluminum and stainless steel surfaces. But on suitable metals, the bluing effect can be seen after 10 or so coats. This is a cold bluing kit so several applications are required to get the desired metallic luster. The coats must be applied evenly, too, for best results. Even the wooden portion of guns can be made shinier with the walnut stain. The Oxpho-Blue chemical works well when prep work is done first on the gun. The rust, dirt and debris on the parts to be blued should be thoroughly removed for the bluing liquid to work. The prep work usually involves sanding, such as with 220-grit sandpaper and oil; cleaning and degreasing with acetone; and heating the metal with a torch heated between 150 and 200 degrees. When it’s applied, let the liquid set for a minute or so. Then rub it down with 0000 steel wool for a fine finish. Depending on the gun’s condition, a few or several applications may be needed to get the desired effect. Many users report even five layers can blue the steel well. For a newer gun, applying the liquid using a piece of cotton flannel usually removes a thin layer of rust without leaving a trail of after-rust. But for an older gun, the prep work is a must because it isn’t effective in removing a thicker layer of rust. Made by Bushnell, the Outers gun blue kit has a permanent cold chemical bluer coupled with cleaning supplies. Many other supplies may be necessary for complete bluing of your guns. After the prep work, the bluing liquid can be applied to the gun’s surface with a clean cloth. The bluing effect doesn’t come with a single application but when multiple coats are applied, the results are similar to professional work. Many users also say that the liquid can even camouflage tiny damages, such as superficial scrapes, on guns including rifles and shotguns. So-called idiot marks can also be removed after a few applications. The chemical penetrates through the metal so a smooth and sleek blue-black finish can be seen. But it only works on guns with a black, nearly-black, or deep blue surfaces, not on silver ones. This is relatively easy to apply, if you know what you’re doing. Beginners may want to watch YouTube videos on the cold bluing process first. 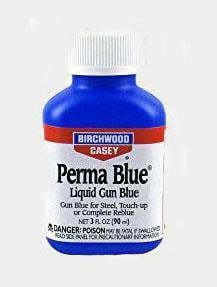 The Perma Blue liquid gun blue on Birchwood Casey kits is usually effective in bringing back the deep shine in metal. While it’s slower in terms of getting the desired dark blue, it still gets the job done. If you’re looking for a product that can be used in touching up worn spots and minor scratches on your guns, then this may well be your best choice. 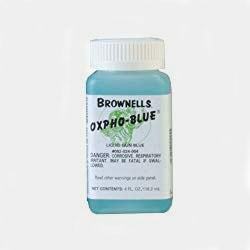 This can also be used in completely re-bluing most of your guns although it’s best used for cold bluing. The non-streaky, nearly blue-black finish, gives guns a better appearance, even when these have been rusty in several places. The denser finish also works well in giving guns limited rust and weather protection. But the Perma Blue liquid only works on guns that have been thoroughly cleaned of their rust, dirt, and oils. You may have to spend 30-60 minutes on prep work before applying the liquid in several applications. Many people also use it for other things, such as on their metal implements. The Kleen-Bore bluing liquid works like magic but only when the gun being blued has been prepped properly. The cold bluing directions are included in the package so be sure to follow them to a tee. Prep work is a must because the bluing liquid will not stick, so to speak, to the metal otherwise. This usually includes cleaning the parts to be blued, heating the areas with a torch, and applying degreaser. 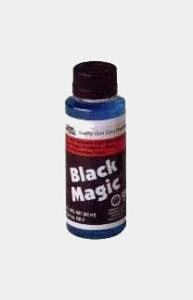 The Black Magic fluid can then be applied with a small clean cloth over the metal areas. Let it stand for a minute, wash off the bluing, and dry with a paper towel. Several applications will be required until the desired blue-black finish is achieved. A coat of oil will also enhance the matte shine, as well as give it a lasting color. This comes with a child-resistant cap as a safety measure. But it’s still best to place guns and their accessories and supplies away from children’s reach. This is suitable for use on guns made of steel only. It’s a minor flaw considering that most guns are largely made of steel anyway. 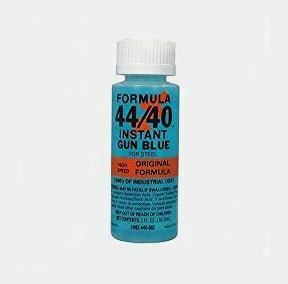 While you still have to clean and degrease the guns to be blued, the Formula 44/40 is so easy to apply. Just dampen a clean cloth with it, wipe it on the metal surfaces, and wipe it immediately with another dry cloth. The familiar bluing effect happens almost instantly, too. There’s no need for soaking and rubbing the fluid in for prolonged periods so the bluing process becomes significantly shorter. The blue-black color penetrates deeper than many gun blue liquids. This results in a longer lasting shine even with the wipe on-wipe off process only. But since it’s an instant gun blue fluid, it doesn’t give professional results for guns with significant rust, among other surface damages. For minor damages and moderate rust, you may want to consider it. The gun’s age, physical condition, and monetary value are among the factors that must be considered before buying your own gun bluing kit. Cold bluing will be enough when the gun’s original bluing is still present, even when there are mild surface scratches, nicks, and dents. But when its original bluing has been worn away, professional hot bluing will give better results. The kits mentioned here are suitable for cold bluing. Even when you don’t have much experience with it, you will likely get great results by following the instructions. The complete kits are better choices for beginners in the bluing process. You can immediately get to work on restoring your guns’ nice appearance since every necessary supply is available in the package. But if you already have most or all of the bluing supplies, then buying just the bluing fluid makes more sense. Most of the recommended bluing kits here come with their own instructional booklets. The steps are clearly specified, a bonus for beginners, with many even containing illustrations. You have to consider your own skills in bluing, as well as the amount of time and effort you can pour into it. If you’re into an easy-to-apply bluing liquid, then the Formula 44/40 may be up your alley. If you want a more involved process, then the Birchwood Casey kits may be more suitable for your needs. You are also well-advised to consider the value of the guns for bluing. If these are non-collectibles, then a cold bluing kit may do the job but for collectibles, ask about a professional doing it for you. Always read the instructions manual after receiving your gun bluing kit. Even when you’re a veteran in the cold bluing process, each solution usually has specific application instructions. But the following steps are common to these kits. Remove the original bluing, if you desire it. Use a phosphoric acid-based rust remover or white vinegar. Polish the gun metal to remove the surface scratches and rust. Sandpaper or steel wool will suffice. Clean the metal. This can be either soaking the parts in cleaning solution or applying cleaning oil to specific parts. Heat the metal using a blow dryer, heat gun, or torch. This will help in the metal’s better absorption of the bluing liquid to create a shinier finish. Apply the bluing liquid according to the desired number of coatings. Each new layer should be applied with a fresh applicator and each one should be smoothed with steel wool. Apply gun oil to season the final finish. It can be applied once every few hours to heighten the finish, too. Before performing these steps, you should ideally gather all the supplies from the cleaning cloth to the bluing fluid on a work bench. The place where the bluing process will be done should also be well-ventilated, while children shouldn’t be around for safety reasons. Who Makes The Best Gun Blue Kit? Birchwood Casey makes the best gun blue kits in my opinion because its bluing solutions are among the most effective. The other supplies from the cleaner-degreaser liquids to the cloth, sponge and steel wool are just bonuses. The heart of any gun bluing kit, after all, is the bluing solution itself! This is the top brand and renowned for top quality guns cleaning kit manufacturers. You can find all the essential accessories whenever you need them, Otis. The company has an extensive R&D unit and produce the best quality product to meet customer demand. Another renowned brand for gun cleaning kit is vista outdoor Inc and their famous brand is Outers (the gunner’s companion). 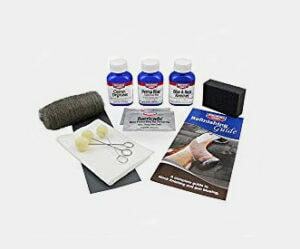 They are producing excellent universal cleaning kit for American hunters also providing quality shooters gun and consider the business is their heritage, commitment and guiding principle for their product line. The company is founded in 1970 with a view to providing hunting, shooting, archery, fishing and outdoor products for customers all over the globe. They particularly focus on USA based market producing gun cases, bags, mats and others. They are well known for producing best and innovative products under the brand name Allen. The company built its reputation over 100 years by manufacturing to quality guns and related accessories. Their aim is to produce extraordinary products to satisfy customer demands. The company was established in 1816 over 200 years they are manufacturing guns and their accessories with height customer satisfaction. Remington is the brand name for producing most innovation and sophisticated firearms throughout its history. Their weapons are produced by involving extensive research and development so they stayed in the market for such a long time. The M Pro7 gunning company is dedicated to providing cleaning services kit to Army weapons to ensure maximum safety and security. Also, the company is well known for testing weapons whether it’s properly working or not also manufacturing various gun cleaning accessories so that their guns working appropriately. Who makes the best gun cleaning kit? There are lots of brands producing gun cleaning kit but all of them are not popular. 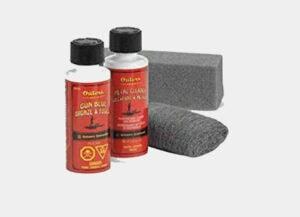 There are few manufacturers are very renowned to customers and these brands are the gun boss, Otis, outers, hopes, M Pro7 and Tipton Ultra are the most popular gun cleaning kit available in the market. What is the best gun cleaning kit? The Otis elite cleaning system with optics cleaning gear is the best gun cleaning kit because it has various components that ensure almost every guns cleaning as possible. 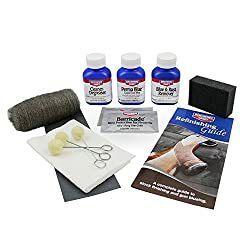 What is the best universal gun cleaning kit for all guns? Outers 62 piece universal gun cleaning kit is the best gun cleaning kit that available on the internet to buy them. Is it a good decision to store a heated surface inside a gun vault or cabinet? It will ensure a little warmer inside than outside that keeps the gun drier, moistures absorbs so it will ensure the longevity of your guns. Is it a jag provides better service or a loop? I would say a jag is better comparatively a loop because a jag can keep separate from the bore more efficiently that a loop. Can you help me to find out best bore cleaner? Most of the brand bore cleaner able to do excellent cleaning job as I mentioned all names in my best gun cleaning kit review but you need to use them properly otherwise you never get maximum benefits from your bore cleaner no matter how good it is. Are Square patches better or do I need to buy round patches? If you are using a jag and want to wrap the patch around it then a square patch would be most suitable, however, if you want to put in the point of the jag then I recommend you to use a round patch. The Birchwood Casey Liquid Gun Blue Kit is the best one in my estimation because of the numerous benefits that it brings to its users. Beginners and veterans in the gun bluing process agree that it’s easy to use, as well as delivers effective results when used according to directions. The kit also contains all of the supplies for bluing guns. The instructions manual that comes with it makes the relatively complex cold bluing process simpler without dumbing it down. While it’s more expensive than the bluing liquid only kits, the all-in-one benefit and effective results are well worth it. So if you’re looking for the best gun bluing kit, I suggest getting the Birchwood Casey Liquid Gun Blue Kit! this is a brand that I had little knowledge about until I came across this blog post. The things I have to look at for my next model and I think this has been useful in understanding the Oxpho-Blue Professional Grade Cold Blue. It seems a quality and inclusive kit to try.